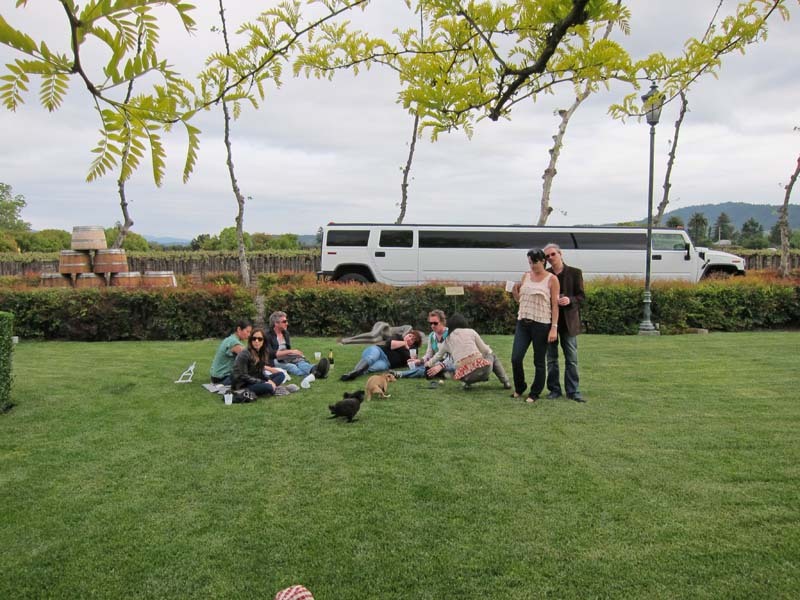 On Saturday, 3/23/2011 some of us rented a limousine to go up wine tasting in Napa. On the trip was Heather, Natasha, Katherine, Pamela, Lynn, Dannielle, Colleen, Shawn, Andrew, Todd, and Brian (me). 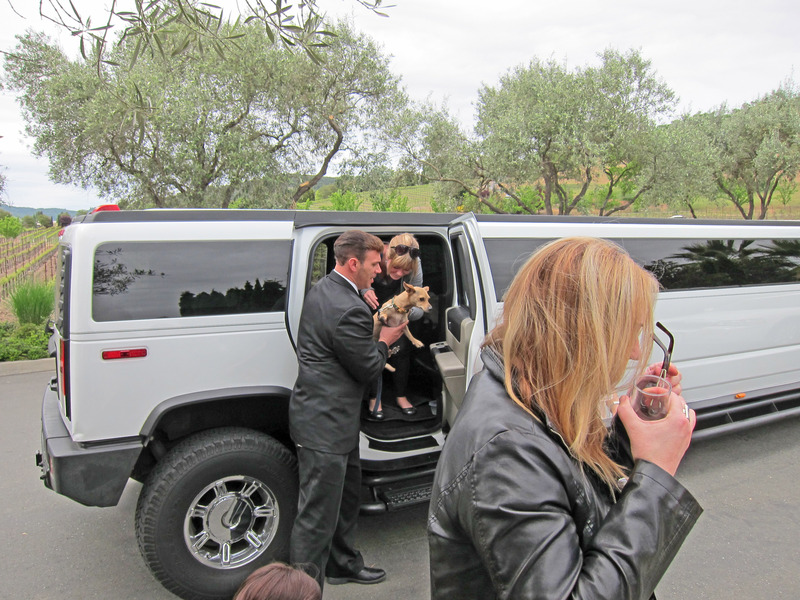 Three "purse dogs" came along: Tuesday, Riley, and June Bug. Below are some pictures from the expedition. Click on any picture to get a HUGE version of that photo. 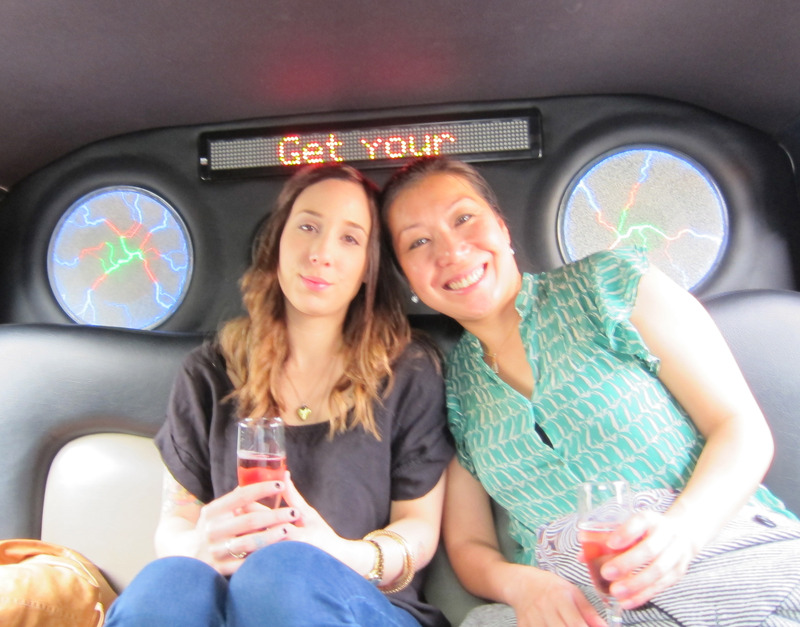 Below we just climbed into the limo at 11am and poured a glass of champagne as we head to Napa. 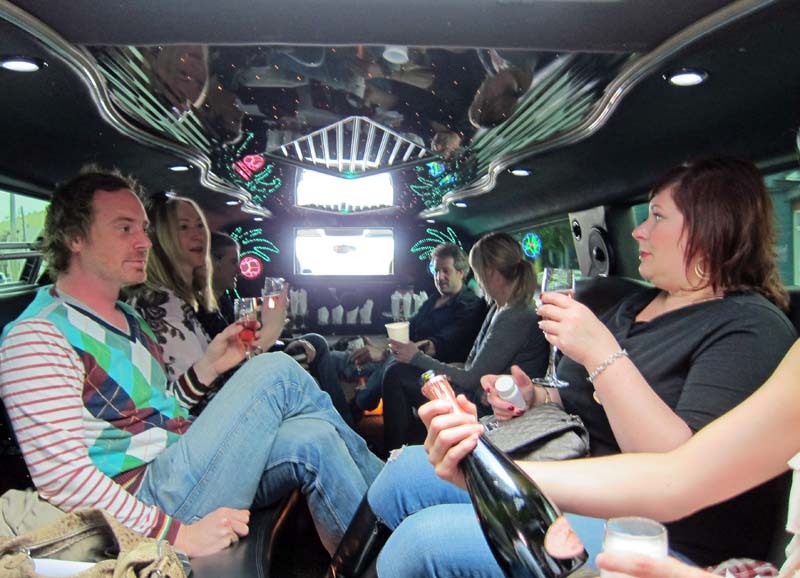 The limo is a stretch Humvee (stretch Hummer) from Bay Limousine LLC and our driver's name was Abel. Dannielle and Lynn in the back. 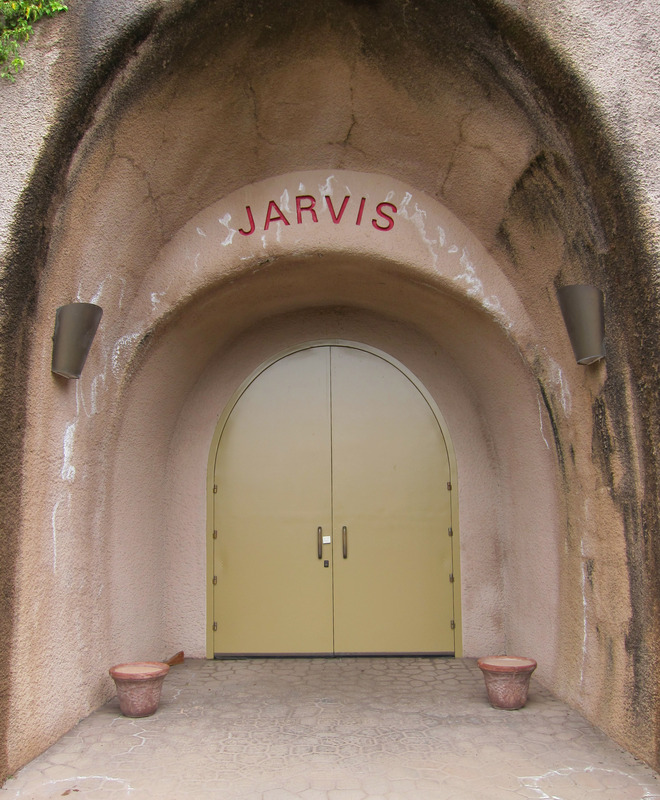 Our first stop was the Jarvis Winery. 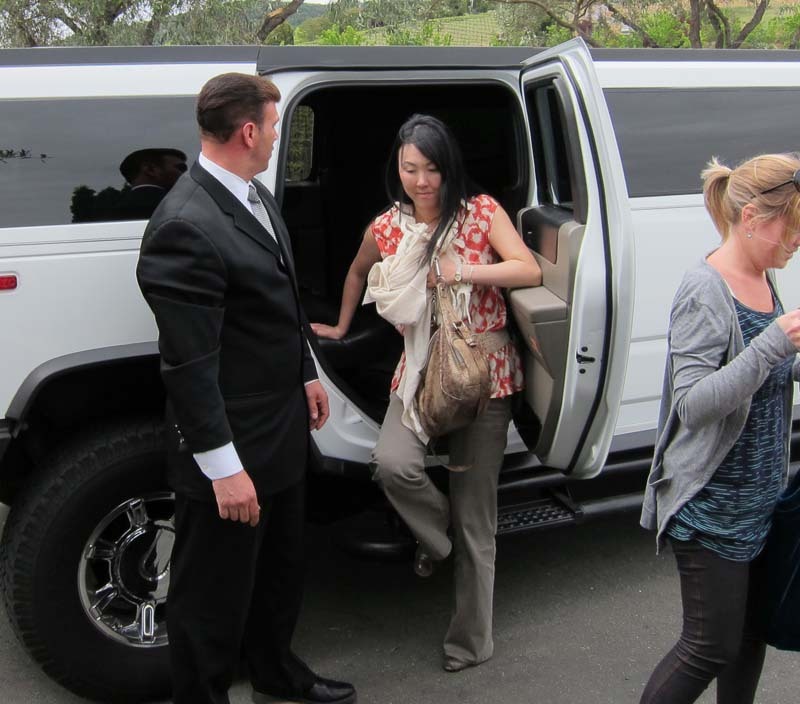 In the picture below, Abel is helping Colleen is out of the limo. 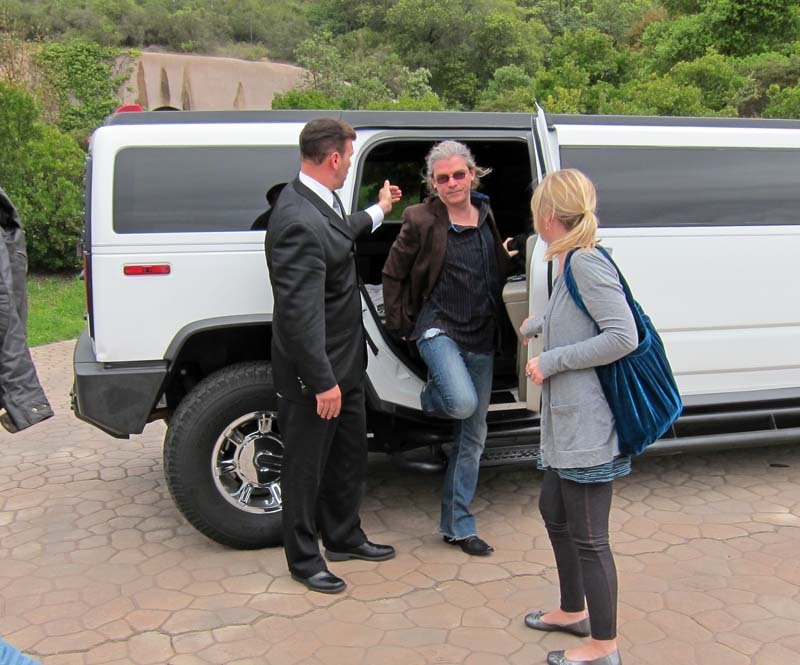 Todd stepping out of the limo. The entrance to the "Jarvis Winery caverns". Upon entering the door above, you walk down these tunnels in the caverns to the tasting room. 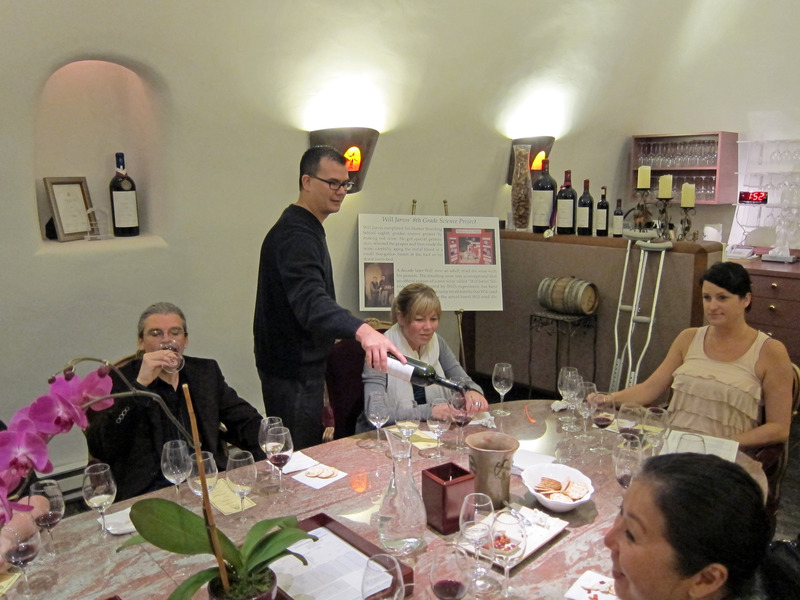 We had a tasting of several wines in the tasting room in the Jarvis Winery Caverns. 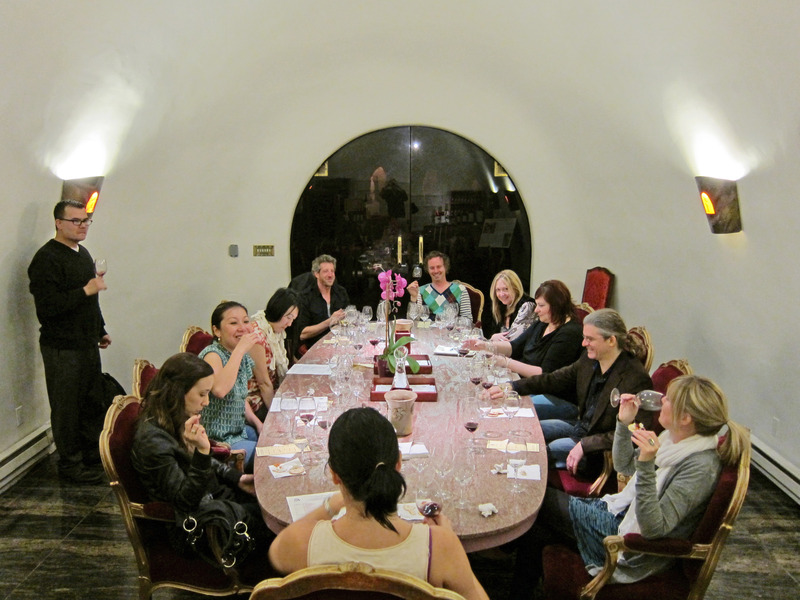 Here is our group in the tasting room. 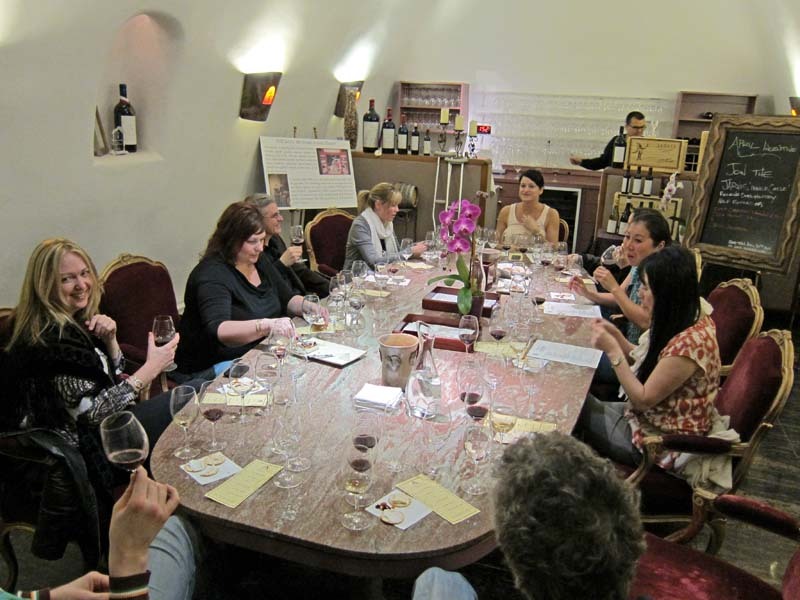 There were 6 wines we tasted that day. 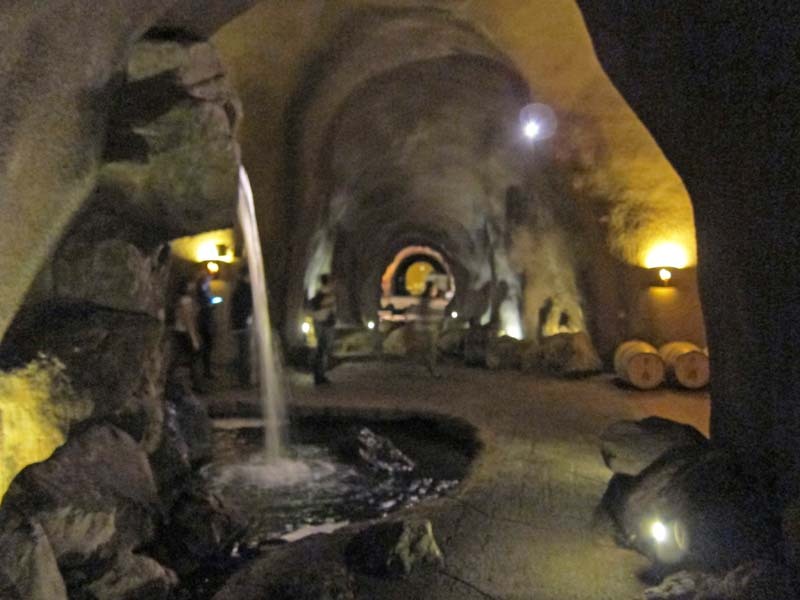 After the tasting, our server walked us around and gave a tour of the caverns. Below is Heather in front of a display. 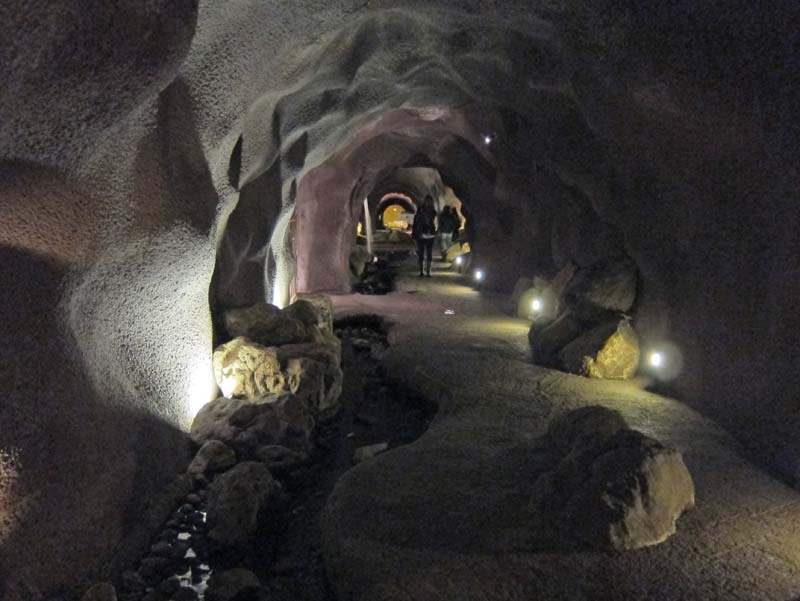 The caverns have a stream running down through them (on the left in the picture below) which they explained was the result of a natural spring they accidentally tapped into while digging out the caverns. 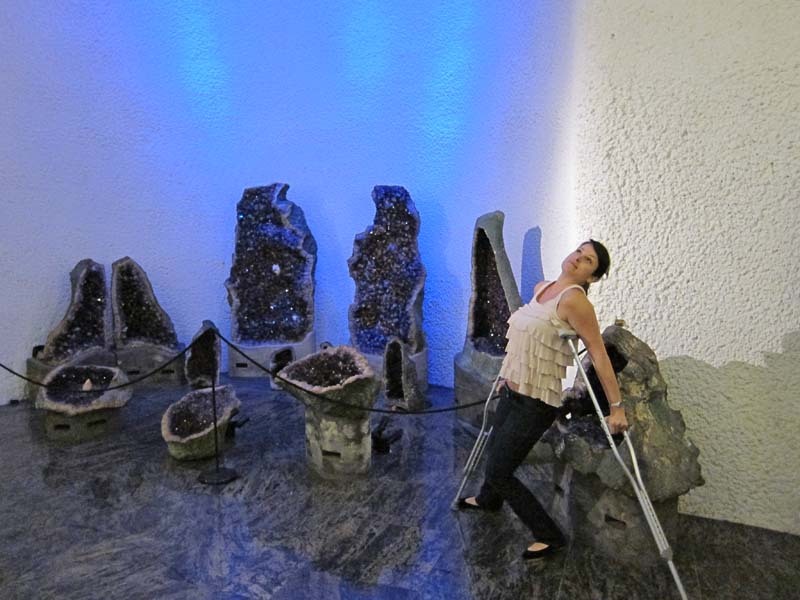 There is a waterfall in the middle of the caverns. I think it's very pretty and well done in the caverns. 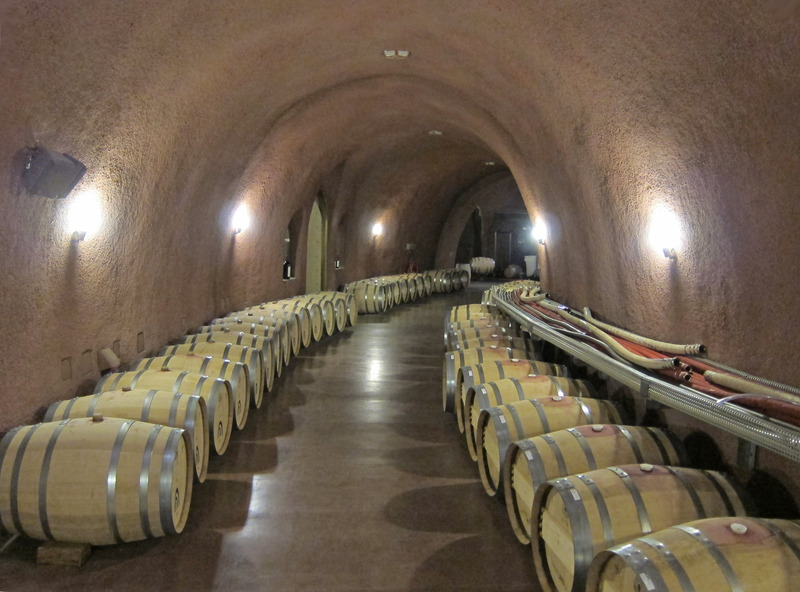 Moving on, our next stop was the Darioush Winery. Below Abel is helping Colleen with her dog Riley. Below Abel helps with Tuesday (Heather's dog) and June Bug (Dannielle's dog). Katherine steps out of the limo. 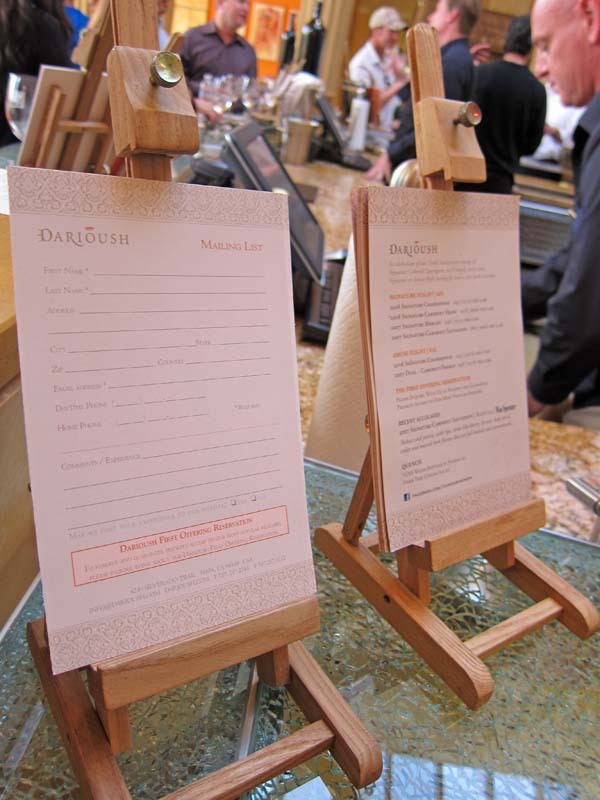 Below is a picture of the main tasting area of the Darioush Winery. Officially they don't allow dogs in the tasting area, but they were nice to us and let us in with the purse dogs as long as they were on a leash and well behaved. 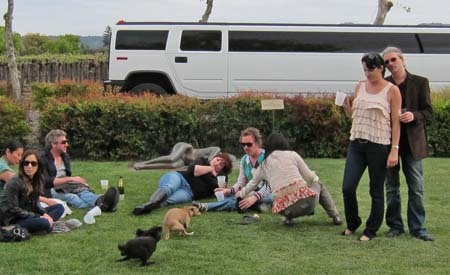 After this tasting, everybody took a rest out on the lawns to let the dogs run around a bit. 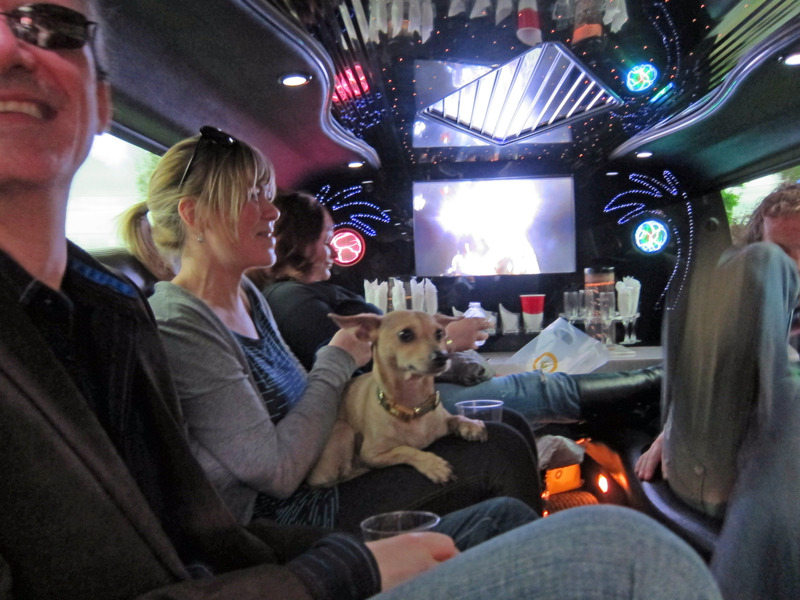 Back in the limo, the driver had loaded up a music video DVD from the 1980s (Run DMC with Aerosmith, Billy Idol, that sort of thing), which was pretty fun. The next stop on our Napa tour was Peju Province Winery. 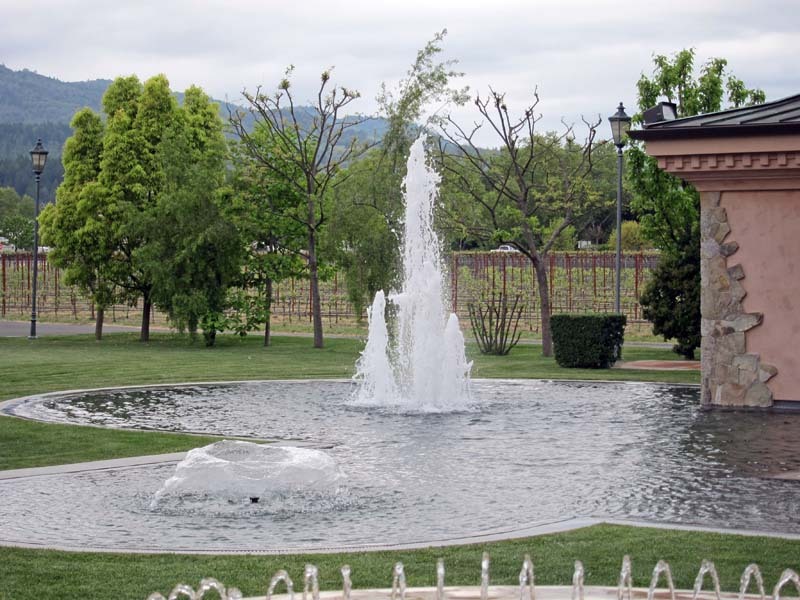 Below is a panorama of the Penju Province Winery and surrounding lawn. Use your horizontal scrollbar to see much more of it hidden off screen to your right. A close up of the fountain. Inside the tasting room at the Peju winery Katherine tries one of their wines. 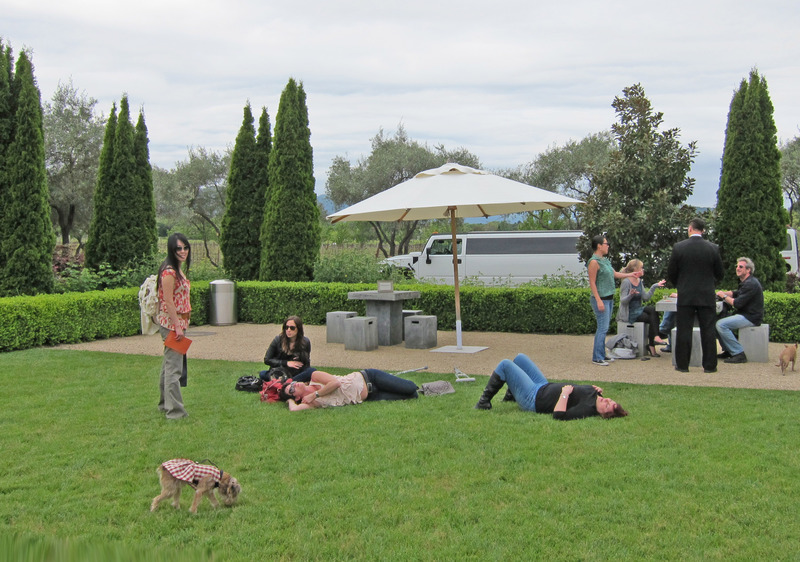 Resting on the lawn outside the Peju Winery. 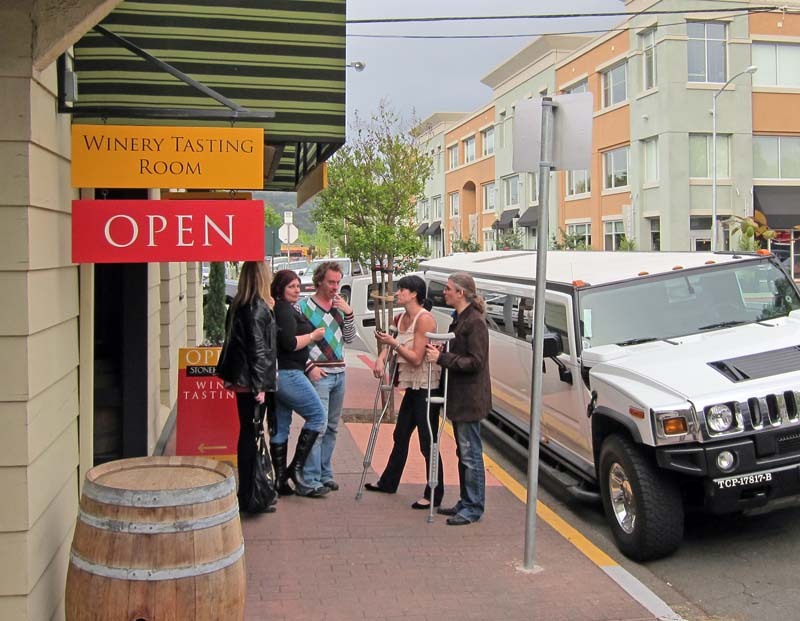 You can see our stretch hummer in the background. 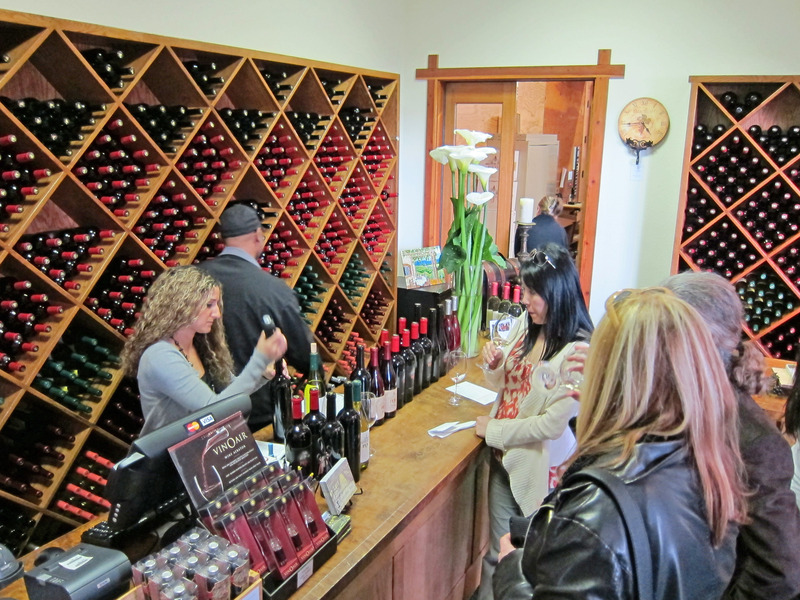 The final wine tasting stop was the Stonehedge Winery. 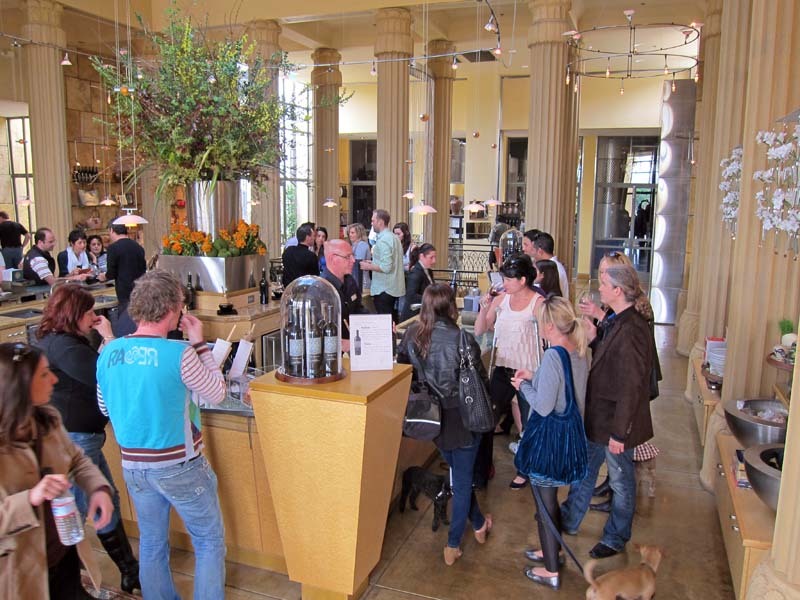 We were at their tasting room in downtown Napa. 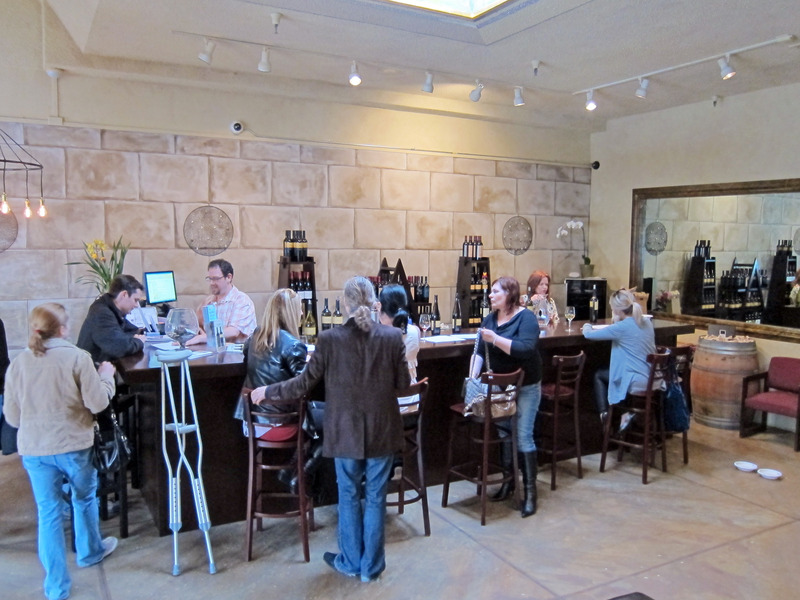 Below we are inside the tasting room at the Stonehedge Winery in downtown Napa. 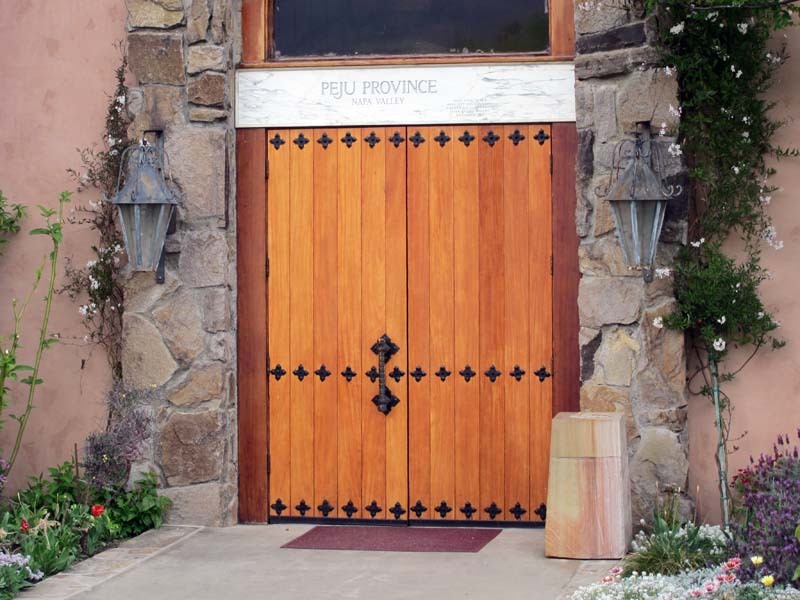 It was past 6pm, most of the wineries close around then and this is open until 8pm so it makes a good last stop. 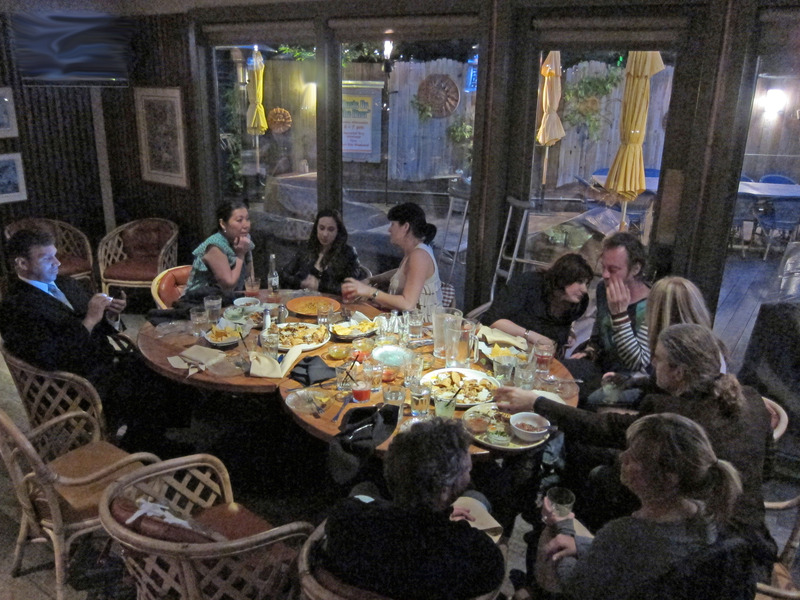 Finally done with wine tasting, we stopped in a Mexican restaurant to get a snack before driving home.